Note: This story is best read after Masquerade, as a cap to the Micah Grey series. 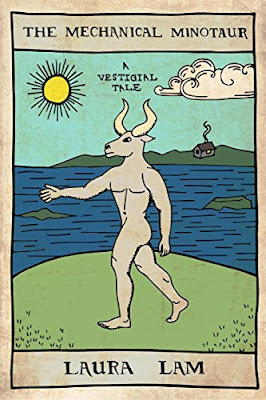 The Mechanical Minotaur is the 5th of Laura Lam's Vestigial Tales but where most of these short stories can be read at any point in the Micha Grey series this one really should be read after Masquerade if you want to avoid spoilers. This is the story of a young boy called Evander who has been treated terribly by his father ever since the death of his mother a year previously. Then on the night of his 12th birthday Evander receives an unexpected gift that makes him question everything he thought he saw the night his mother died. Now Evander is on a quest, with the help of a vestige mechanical minotaur, to uncover what truly happened that night but it won't be an easy journey. I don't want to say much more about the story but this was a nice addition to the Micha Grey world and I really liked Evander's character. This does tie into the main series but you don't really figure out how until nearer the end of the story so I'm not going to spoil things by saying how. Evander was a really sweet boy and I think I'd have liked his story even more if it had been a little longer, as it is I don't think it was a particularly necessary addition to the series but it was worth reading if you want to see a bit more of this world.